When the baby is six months old, then they are probably ready to get the intake of solid foods. One of the solid foods that can be used as an option to support the baby's growth is baby porridge. Giving solid foods is a crucial step in baby development. Make it an opportunity to explore the taste and texture of the food you want to make a baby porridge. The most important thing to be understood by parents is not to stick to how many babies eat solid foods but focus on giving the habit to the Little to eat. Along with the development, increase the amount and variety of food until they finally have the ability to dine with the family in small portions. In addition to age, some of the things below become a marker that parents are able to provide solid foods to babies. The baby's mark is worthy of porridge when he is able to hold his head upright and stable. In the beginning, the baby's ability to sit well can be done on your lap. At the time the baby is able to sit upright independently, give the baby seat and close to the baby porridge placed on the table to make it easier for him to eat it. The least important capability a baby must have is also being able to chew and swallow solid food. Normal if at first, you will see Little Person having difficulty in chewing and swallowing solid food well. Pay attention to Little when you are eating a nearby food. If he is after the food and trying to reach what you are eating, it indicates that he is ready to be given baby porridge. Readiness shown by infants to receive solid foods can be seen from the ability to manage body coordination. If the baby is able to see, take, and put food into his own mouth, he is most likely ready for solid food. Based on their weight, babies are usually ready to accept semi-solid foods such as baby porridge is when the weight at age around the age of six months to double the weight at birth. When the baby is six months old and shows signs that he is ready to receive solid food, then parents are advised to start wary of what foods can cause allergies. The foods that commonly cause allergies are eggs, fish, shellfish, soybeans, and wheat. Parents are also advised to recognize foods that can cause gas formation. The amount of gas in the baby's stomach is likely to cause it to feel uncomfortable. Some foods that can cause an abundance of gas in the stomach are garlic, beans, milk, and various cruciferous vegetables (broccoli, cauliflower, and cabbage). If you want to introduce this food, you should wait until the baby is 8-10 months old. If possible, give organic food or meat that comes from raised animals, not fed. Apples, peaches, grapes, strawberries, spinach, peas, and potatoes can be an option for a mixture of baby porridge. For the age of 4-6 months, baby porridge for your child can be made from banana, avocado, or sweet potato. 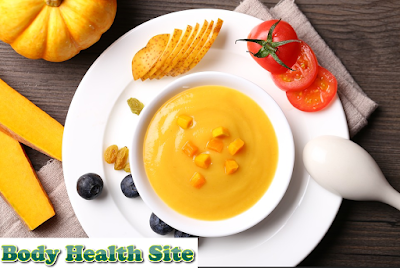 Other ingredients that can be used as porridge are carrots, baby cereals, and peas. 0 Response to "Introducing Baby Porridge to Your Baby"